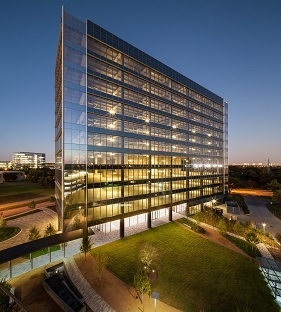 Piedmont Executes Full Building Lease for Enclave Place in Houston | Piedmont Office Realty Trust, Inc.
ATLANTA and HOUSTON- October 10, 2018 - Piedmont Office Realty Trust (NYSE: PDM) announced today that a major oilfield services provider has signed an approximately 17-year lease for the entirety of Enclave Place, Piedmont's newly constructed, approximately 300,000 square foot, Class-A, office building located in the Energy Corridor of Houston, TX. David Bale and Louie Crapitto of JLL represented the tenant in the transaction, and Damon Thames and Connor Saxe of Colvill Office Properties, as well as Damian Miller, Piedmont's Sr. Vice President - Southwest Region, represented Piedmont. Commenting on the transaction, Joe Pangburn, Piedmont's Executive Vice President - Southwest Region, said "We are thrilled that Enclave Place has been chosen as the site for a new US headquarters facility and we look forward to welcoming the building's inaugural tenant when the lease commences next July." Enclave Place is an 11-story, Class-A office building located at 1414 Enclave Parkway in Houston, TX, adjacent to Piedmont's other Houston property, 1430 Enclave Parkway. The building is certified LEED® Silver for core and shell and was designed by Gensler. Tellepsen acted as General Contractor. Piedmont Office Realty Trust, Inc. (NYSE: PDM) is an owner, manager, developer, and operator of high-quality, Class A office properties located primarily in eight major cities in the eastern half of the U.S. The almost $5 billion portfolio is comprised of approximately 17 million square feet of office space. The Company is a fully-integrated, self-managed real estate investment trust (REIT) with local management offices in each of its major markets and is investment-grade rated by Standard & Poor's (BBB) and Moody's (Baa2). For more information, see www.piedmontreit.com.